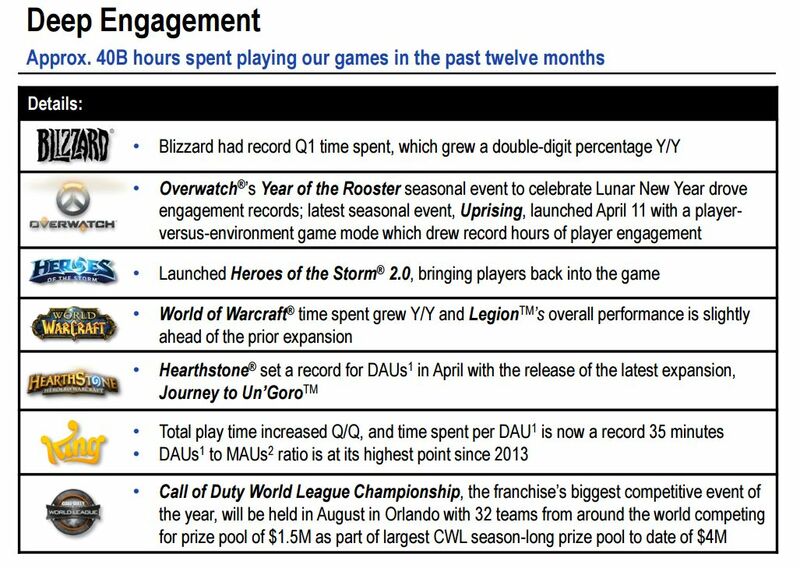 Blizzard games are doing the business, thanks to record monthly active users, and continued sales of World of Warcraft in-game content and “continued strength” of Overwatch customization items, Activision-Blizzard had rather great Q1 2017. 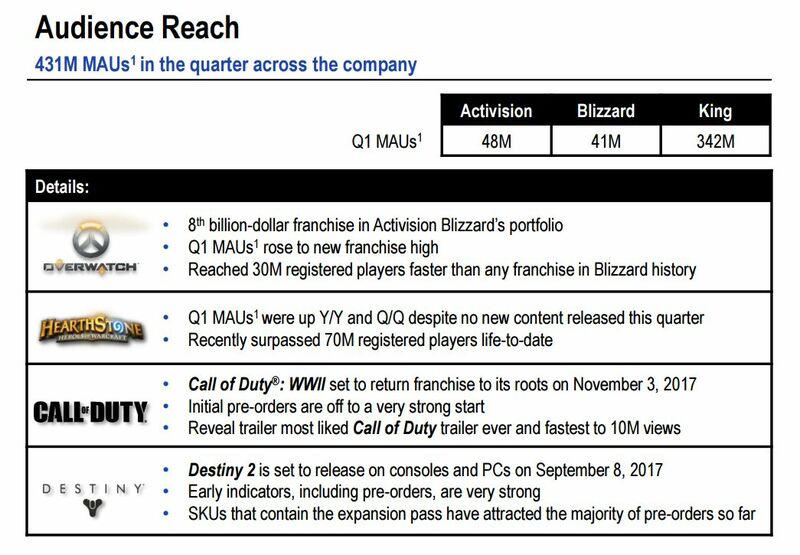 According to Activision-Blizzard, the company as a whole had 431 million monthly active users (MAUs) during the quarter ending March 31, 2017, with $215 million revenue for the sector. Games not developed by Blizzard, saw a decrease in MAUs to 48 million year-over-year (yoy) compared to 2016. 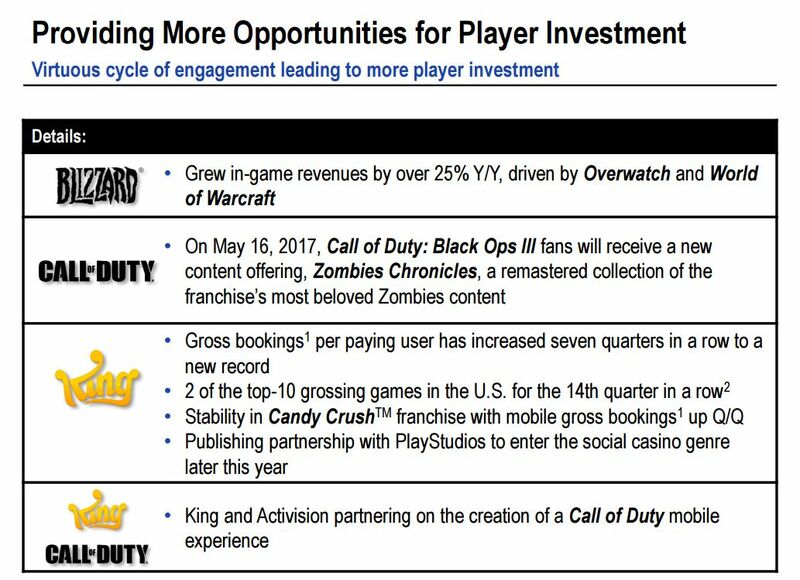 Activision-Blizzard attributed this to “expected softness” from last year’s Call of Duty: Infinite Warfare release. Last week’s reveal trailer for Call of Duty: WW2 had the most “organic views” and was the most-liked video for the franchise ever on YouTube – unlike Infinite Warfare, bless. 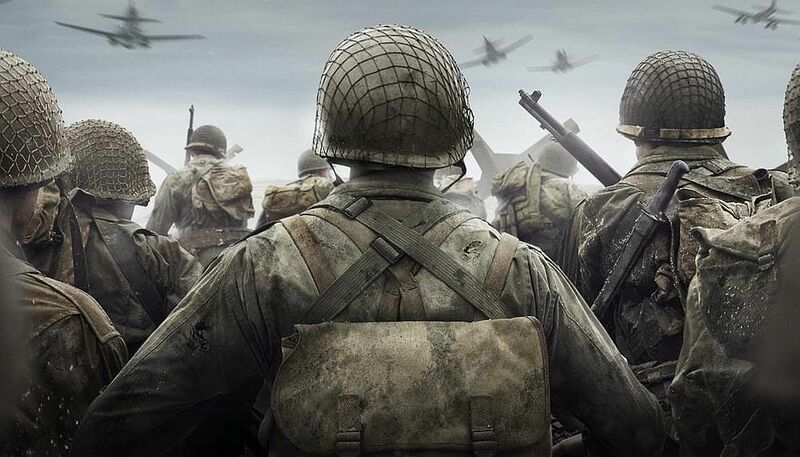 Initial pre-orders for Call of Duty: WW2, although very early are also off to a very strong start, said Tippl. As previously reported, the multiplayer portion of the game will be revealed in June. New content for Call of Duty: Black Ops 3 fans, Zombies Chronicles, is set to launch on May 16, first on PlayStation 4. The remastered collection includes eight of the franchise’s Zombies maps. Destiny 2 wasn’t mentioned too much during the call, only that Bungie will release it on September 8 for current platforms and the addition of PC – all of which was previously announced. The firm said the response to the Destiny 2 reveal “was very encouraging,” and pre-orders are off to “a very strong start.” The most important thing for the title, is to continue to “get the content pipeline right,” according to Hirshberg, reiterating comments made about Destiny 1’s previous content releases and how the same mistakes won’t be repeated with Destiny 2. Back in November, the firm said during a call to investors that desire for original Destiny content outpaced the ability to deliver. Going forward, the firm will have a better approach “to delivering a steady stream of great content” to help keep players engaged. This will also help keep the “universe alive and growing” in Destiny 2. Finally, Hirshberg also added Destiny 2 will have “meaningful features for the PC community” which will be revealed on May 18 during the livestream. Hirshberg also said to expect some sort of free update to Destiny at some point. He didn’t add anything further. Overwatch is the 8th title to hit $1 billion. Destiny 2 will have “meaningful PC features” for users; steady stream of content. People like the Call of Duty: WW2 trailer better than Infinite Warfare’s reveal trailer. Blizzard Games raked in $441 million during Q1. 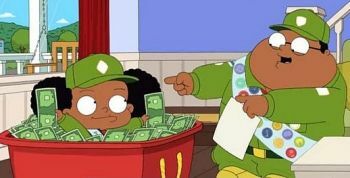 Activision Games reported $215 million revenue for Q1. 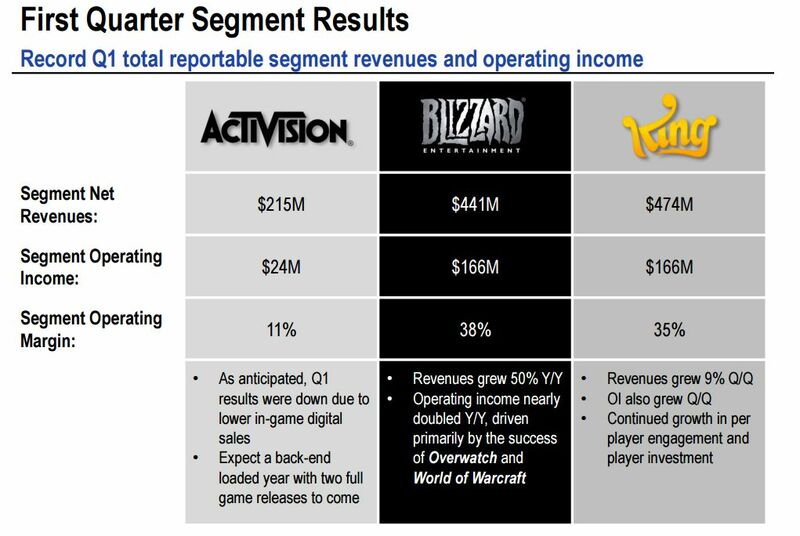 Company revenue for Acti-Blizz as a whole was $1.73 billion. 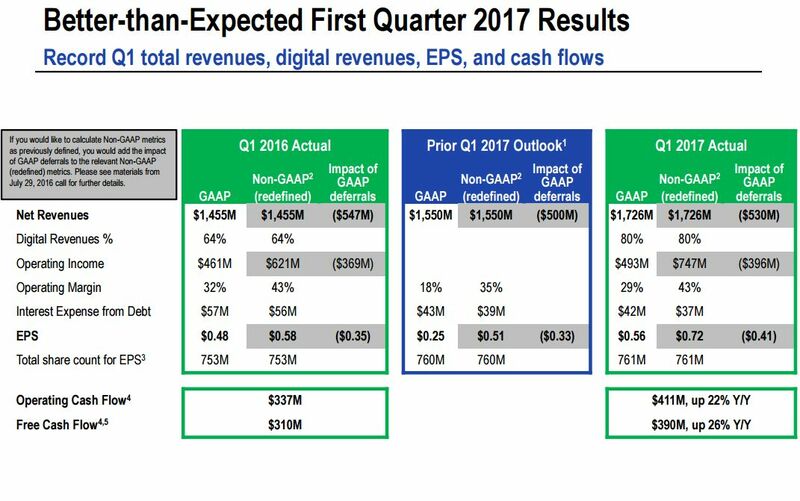 Digital made up 80% of Q1 revenue with $1.39 billion. Blizzard had the biggest Q1 online player community in its history with 41 million MAUs, up 58% year-over-year. Revenues from in-game content were up over 25% yoy, thanks to World of Warcraft in-game content and “continued strength” of Overwatch customization items. Q1 2017 revenue for Blizzard clocked in at $441 million, which is an increase of 50% yoy. Overwatch’s launch anniversary is coming up on May 24, and there are many “opportunities” to grow the brand said company boss Mike Morhaime. He did not add any color to future plans for the game, but surely a one-year anniversary party for players would be a nice touch. The game’s seasonal event, Year of the Rooster broke the previous engagement record until April’s Uprising event hit the record time spent milestone. Overwatch continued to be developer’s fastest growing new franchise, reaching over 30 million players globally, as previously reported. The game is now the eighth billion-dollar franchise in Activision-Blizzard’s portfolio. Hearthstone’s monthly active users also grew year-over-year (yoy) and quarter-over-quarter, despite no content releases during the Q1 period. The April release of Journey to Un’Goro brought in a record amount of monthly players. It recently surpassed the 70 million registered player milestone life-to-date. The company reported record Q1 revenues and digital revenues for the period ending March 31, 2017. Net revenues were $1.73 billion, as compared with $1.46 billion for the first quarter of 2016, an increase of 19%. Digital channels brought in $1.39 billion for the quarter, which is a 50% year-over-year growth. 80% of revenues came from digital channels compared to 64% yoy. “Among the drivers of our results was Overwatch, which now has over 30 million players globally,” said company CEO Bobby Kotick. “The Overwatch League is gaining momentum and we’re excited to offer our community of players the best professional league experience.